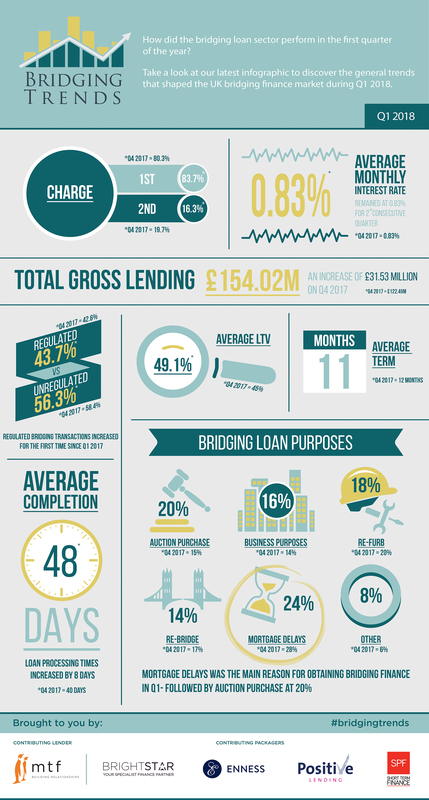 Take a look at the infographic below to see the trends that shaped the bridging finance market in the first quarter of 2018. “It is particularly interesting that pricing has remained stable, despite an increase in regulated lending. This suggests that the recent downward pressure on rates might be easing and in the unregulated space, going the opposite way. “We’ve undoubtedly seen an increase in volume for bridging finance, but I also wonder if the breadth of lending that specialist lenders now provide is a contributory factor. For example, by definition, bridging loans are a short-term finance facility. However, that definition is now being stretched, with bridging lenders often able to offer facilities for up to two or even three years now. “Lenders are also offering loans for more varied purposes, like ground-up development. We now even have Sharia-compliant facilities in our toolbox, allowing us to cater for a wider audience. Therefore, the increase in lending perhaps results from there being more things you can ‘do’ with bridging.